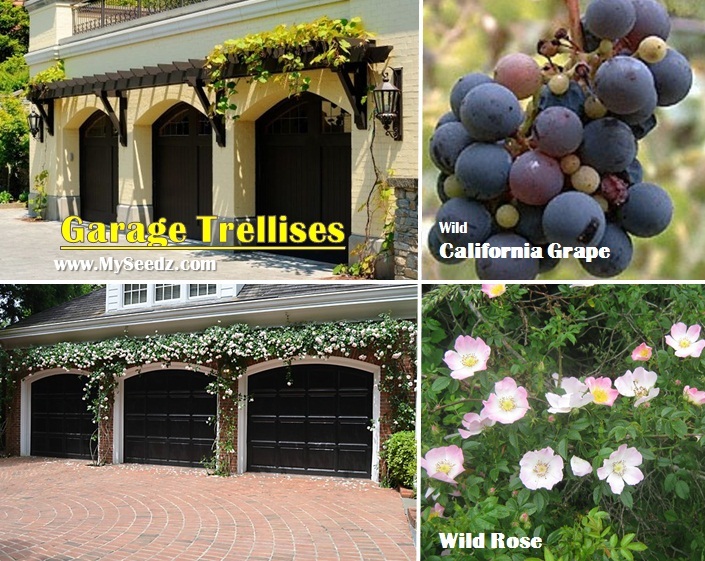 A trellis over the garage, covered with a perennial vine, is not only beautiful it draws attention to your home, conveying your sense of beauty. It can turn a boring garage entrance to something spectacular that makes a statement. For best results the garage entrance should be receiving sun at some point in the day. Here are some ideal choices. (1) Roses: Roses thicken the air with their nostalgic fragrance and the abundant blooms draw the eye. Wild Rose and Rose Rugosa are some wild varieties to plant. The vines need to be pruned to shape. (2) Grape Vines: A Grape vine makes a definite statement and the grapes hanging through the trellis is beautiful and can be plucked for food. Wild California Grape is a good choice for a sunny Mediterranean feel. The vine needs to be trained to shape and pruned. All the above vines grow from seed or can be transplanted in to position.If your garage entrance is bare at the moment, this is an idea to implement that will give instant transformation that is colorful and bears fruit.